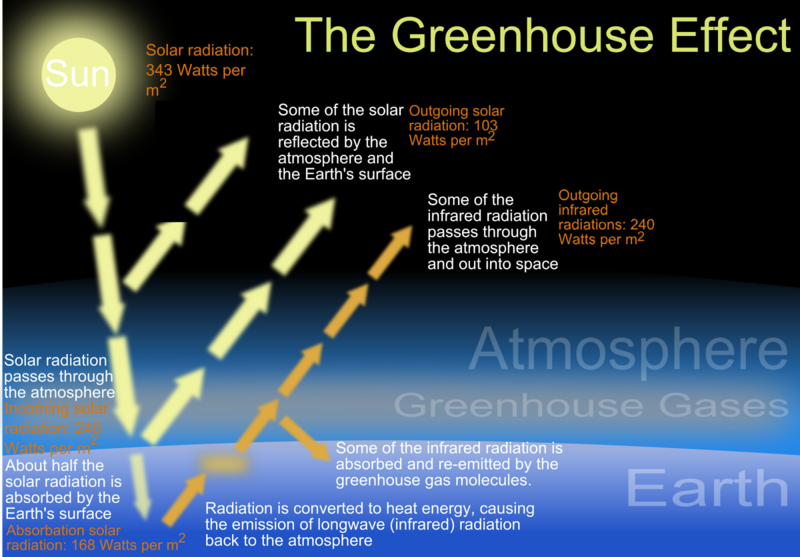 Greenhouse effect refers to the natural atmospheric phenomena that absorb solar radiation making the earth ideal to support life. Human activities in the recent past have played a role in increasing the amount of greenhouse gases in the atmosphere. The common greenhouse gases are water vapor, nitrous oxide, carbon dioxide, methane, sulphur hexafluoride, and hydrofluorocarbons. Some of the gases occur naturally in the atmosphere while others are synthetic and generated by human activities. The air is composed largely of nitrogen and oxygen. However, the tight molecular bond that exists within the atoms of this gases makes them hand to vibrate. Therefore, they do contribute to the absorption of heat in the atmosphere and are not greenhouse gases. The three gases that contribute largely to natural greenhouse effect are carbon dioxide that comprises of 50% of the atmosphere. Water vapor, methane and nitrous oxide are the other gases that constitute to natural greenhouse effect. These gases are not synthetic and occur naturally in the air. Therefore, they constitute to natural greenhouse effect. Human activities such as burning oil and natural gas and also cutting down of trees and ploughing the land increases the amounts of carbon in the air. It becomes the greatest contributor to changes in climate and represents approximately two-thirds of the gases produced by human activities. As a result, the greatest contributor to anthropogenic greenhouse effect. The latter stipulates the origins of human beings and their activities. Based on activities carried out by humans, it is true to say that these activities keep on changing, and modern life increases the production of this gas. In conclusion, it is worth noting that other gases such as nitrous oxide also occur naturally in the atmosphere. However, human activities from sources such as legumes, fertilizers, organic matter and manure increase the levels of the gas.